Paths of hundreds of kilometres entwine through the Ore Mountains and they often go along the cycling tracks. This site will show you some destinations reachable by walking in the vicinity of Boží Dar. You can combine these tours as you like. Detail information about tours and more practical tips provides the stuff at the Tourist Office Boží Dar. You can combine classical hiking with recently very popular sport -Nordic walking. Where to: You set out on the trail from the Tourist Office Boží Dar. Where to: the first information board is placed on the Boží Dar square. Before you head to the end of the natural trail, make a stop at Blatenský vrch and take a look at the beautiful scenery from a stone-made lookout tower. Where to: Connect onto the trail from a roadway leading to Ryžovna. The trail starts 150 meters behind the last information board of Božídarské rašelinište nature trail. These two border crossing trails are designed for hikers, cyclists and cross-country skiers. They are connected to the network of the Czech-German border tracks. Lukáš Bauer Tour is 7,5 km long and Jens Weissflog Tour is 24,5 km long. Where to: Both trails start in Boží Dar and continue to Na Vraky and return on the road from Boží Dar border crossing. While going from Boží Dar to Klínovec you find a monument from the time of the empress Maria Theresia. About 150 meters from today’s border crossing there is an old border stone on the border of three historical areas (Bohemia, Saxony and a territory belonging to Schwarzenberg family). It is a three-sided stone with a historical coat of arms on it. Next to the old stone, there is a today’s border stone marking the Czech-German border. Where to: State the trail towards Klínovec, cross the roadway near a turning leading to Neklid Ski resort. Continue to a wooden cabin and then go along a concrete path to the state border. Follow the border apx. 150 metres. Klínovec , the highest peak of the Ore Mountains, offers its visitors wonderful opportunities for trips. 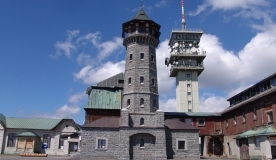 There is a TV broadcasting tower on the top of the mountain and an observation tower extended with a hotel, but they are currently in poor condition. After you mastered some ascents you will be treated to magnificent views over the Czech and German panoramas. Where to: If hiking or biking, follow the red-marked path from Boží Dar. You can also use a cableway from Jáchymov which should be less demanding for you. Village of Ryžovna, a typical hamlet of the Ore Mountains, was established to obtain the grains of tin and ore mining. Later on, agriculture and making bobbin lace were very common. As other villages in this region, Ryžovna was levelled except for a few buildings and only a few residents are still living there. Where to: Ryžovna is located about 6 km to the west from Boží Dar. Set out on the nature trail Božídarské rašeliniště (Boží Dar Peat Bog), then connect onto the nature trail Blatenský příkop (Blatná Water Ditch) and you certainly won´t miss Ryžovna..
Where to: Follow green-marked of yellow-marked path from Boží Dar. The green-marked one leads to the Royal Mint, yellow-marked to the spa centre of Jáchymov.